You’re about to learn 48 everyday words for things in the house. 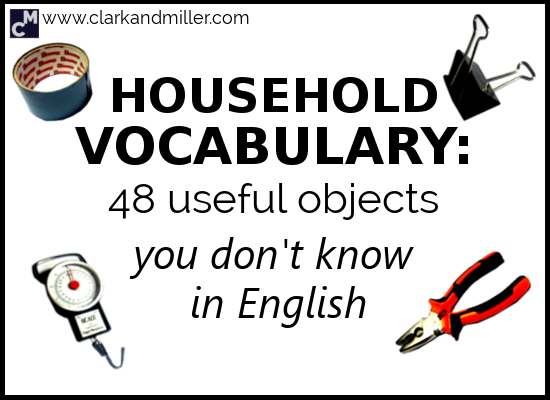 Also check out Kitchen Vocabulary: 48 Things in the Kitchen You Don’t Know in English. If you don’t know what these are, then you need a vocabulary boost for common household objects. So let me introduce you to 48 useful things I found in my living room that you might not know in English. This is a luggage scale that we bought to weigh our luggage just before going on a cheap flight — we packed our bags to exactly 8 kg. Yep — we travel like pros! You can also use a kitchen scale to weigh the food you’re cooking, or a bathroom scale to weigh how much of that food is now stuck in your body. For forcing objects to do things they don’t want to do. Screwdrivers are so useful, aren’t they? Here we a have a simple set of screwdrivers. While I was taking all these photographs for this post, I discovered that we actually have THREE Allen key sets. I guess I really like buying Allen keys. They’re pretty useful, though — especially if you’re a cyclist. You never know when you’re going to need a hook. So that’s why we have one. Gaffer tape is amazing. It appears to be stronger than metal. There’s nothing you can’t fix without a bit of gaffer tape. If you can’t fix it with gaffer tape, you haven’t used enough. Gaffer tape’s uglier, less useful cousin. But it isn’t. It’s still Blu Tack. Even though it’s pink. It’s so surprising how difficult this stuff is to find in some countries. When we were living in Russia, just before we went back to England for the holidays, our school used to ask us to bring back lots of Blu Tack. You just can’t find it in Russia. So how do people put posters up on the wall? We never found out the answer to that. OK. We all know what “pen” means. But let’s look at these three common types. On the top, you’ve got a marker. They’re usually not used for writing, but for “marking” things like CDs, things you’re building or making, or Kevin’s face while he was sleeping. That was a fun night. Markers have lots of different names, but most of them have the word “marker” in them (like “marker pen,” “marking pen,” etc.). In the middle, you’ve got a biro, ballpoint pen or ball pen. They’re probably the most commonly used pens around. What I don’t understand is why the most common colour for them is blue. I mean, why blue? Surely black makes more sense? Same with tattoos. The world is so mysterious sometimes. Finally, at the bottom, you’ve got a felt-tip pen. Great for drawing awful, child-like pictures with. If you want to get technical about it, this is actually a type of marker, too. Ask any teacher what the most important piece of stationery is in their life. It’s a nice little word, too, isn’t it? This useful thing’s called a bulldog clip. Because it looks just like a bulldog! Then I don’t know why. But it’s a fun name, though, right? It’s where you put all your important documents. And maybe old letters you want to keep. There it is! It’s string! Just one of those useful things in the house — and better for tying things together with than an ADSL cable, for example. No, just joking. It’s totally not Christmas. But you might still need this if you’re buying someone a birthday present. Often known just as the remote and sometimes the zapper. They’re usually for TVs, but you can have them for other stuff, too, like the air conditioning or the garage door. Maybe soon they’ll produce remotes for screaming children. Useful for all sorts of things! The ones in this picture are AA batteries (pronounced “A – A” or “double-A”). You also get AAA batteries, which we usually call triple-A batteries or triple-As. You also get those square ones too, right? They’re called 9-volt batteries. In my house, these are commonly used for long YouTube sessions, sitting around with friends and showing each other music we like. We can be doing this for hours. When you just don’t have enough USB ports for all your favourite devices. Or when you’ve spilt beer on your laptop keyboard while playing Sonic the Hedgehog and have to use an external keyboard for two weeks. Which might or might not have happened to me. You know what this is for, of course. You probably have at least one in your house. Sometimes you can plug two things into them. Then we call it a two-plug or two-way plug. Sometimes you can plug three things into them. Then we call it a three-plug or three-way plug. Have you ever been to the UK? The plug sockets there are completely different from almost everywhere else, right? So you’ll need to get an adapter. This one’s for the UK specifically, so I’d call it a UK adapter, but they’re commonly known as travel adapters. We can see what these are, right? Pillows are for the bed. Cushions are for the sofa. Great for lazy days. I wasn’t happy about how any of the photos we took of me in a high-vis looked. So I decided to replace my face with David Attenborough’s. Because why not? Anyway — a high-vis or a high-vis vest is what I’m wearing here. It’s particularly useful when you want to go cycling at night. But my brother has also discovered that if you’re wearing a hi-vis, you can often just walk into events (like concerts and festivals) without paying. Everyone just assumes you’re working there. It’s nice to have a camping chair. It makes you feel like an active person — the sort of guy who goes out camping and survives by drinking river water and hunting tomatoes. Even if you just have it on your balcony all the time and use it to drink tea in. OK. I know this looks like it belongs on a horror movie set. Sorry about that — there’s just no way to take a photograph of this without it looking evil. But it’s not evil at all. It’s so you can scratch your back and get that hard-to-reach spot. For the cat, of course. She’s completely destroyed it, hasn’t she? These are those things you put onto the washing line when you’re leaving clothes out to dry. It stops them flying around and prevents the city being terrorized by flying shirts. It’s a thing that stops doors. So we decided to call it a stop. A doorstop. And it’s always good to have a map on the wall or even a globe on your coffee table. Here’s a quick test: name 3 countries beginning with the letter “R.” You’ll be surprised how tricky that is. Leave your answers in the comments. When you want to make the living room look pretty. And when you think that the combination of fire and having a curious cat isn’t such a bad idea. OK. It’s more or less impossible to take a photo of this and make it clear what it is. Basically, this is stuff that smells nice. You burn it, and it makes the house smell nice, too. It’s traditionally used in churches. It also comes in stick form. You know what I mean, yeah? By the way, while doing the research for this, I discovered that this stuff can be really bad for your health. I think I might throw mine out, now. Everything you need to sew those name tags onto your kids’ school clothes or to repair the damage to your shirt after your weekly wrestling session! The needle (the sharp, metal object) and the thread (the string stuff). I’m a big fan of sewing. I remember one Sunday several years ago, I was so bored that I decided to sew the front of one T-shirt onto another T-shirt. We can see what this is, right? “Hey! This doesn’t belong here! Surely this a bathroom thing!” you may or may not be saying. But I actually keep a shaving brush in the living room for my laptop. Dust gets everywhere, especially when you have a cat. I’ve found that one of the best ways of getting dust off your laptop, without getting it wet and risking damage, is with this little guy. This is another item that’s almost impossible to take a photo of. Basically, you use this so you can put on your shoes more easily and without causing damage to the back part of the shoe. The string for your shoes. So in the US, they logically call them shoestrings. But in the UK, we like to be difficult. So we call them shoelaces. There are two things in this picture (not including the wall). And there’s a plant pot. The pot plant is the plant. And the plant pot is the pot (containing the plant). Something you put stuff on that you want to carry together. Basically used when we’re feeling lazy and want to have dinner lying down. We all do it, right? The place we put them — that’s called a bookshelf. She’s always here. Looking out of the window. Thinking about the meaning of life and planning retirement off her YouTube millions. That’s it — all those little things in my living room that you might not have known the word for. Everyone’s living room is different, so there are probably loads of things you have that I don’t have. Let me know in the comments what’s missing from the list, and I’ll do my best to add it. Did you find this useful? Do you know any people (or anacondas) that might also benefit from this? Then BE AWESOME AND SHARE! Spread the knowledge! The three countries are: Russia, Rwanda and Romania. Thanks for your lovely and useful posts. The three countries are Rwanda, Romania and Russia. Thank you so much for this great post. I really like it!!! It’s a tough question, so well done! Thank you for this useful info! Thanks for sharing your helpful and valuable informative post. Can you tell me? What do I need to do when moving into a new house? Long debates about politics and philosophy? No probs. A pair of pliers and a napkin? PANIC! Gabriel Clark is an English teacher with 14 years’ experience and an MA in TESOL and Applied Linguistics from Portsmouth University. He’s the “Clark” in Clark and Miller, a website that focuses on giving learners a deeper understanding of how English works through online courses and a blog that often features giraffes. He can be found giving talks at conferences, cycling around post-Soviet neighbourhoods or performing music in empty bars. Relation vs Relationship: Do You Know the Difference? WANT TO LEARN ENGLISH 5 TIMES FASTER? Get your free eBook plus weekly email tips!